Virtual Pets Blog » Blog Archive » Panasonic Heated Carpet for Plush Virtual Pets? Panasonic Heated Carpet for Plush Virtual Pets? Panasonic showed a new fiber at the Tokyo Fiber 2007 Senseware Exposition in late June 2007. 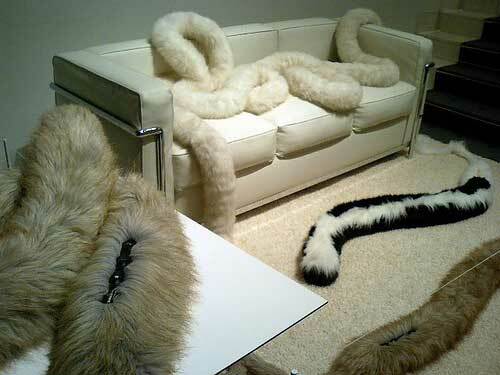 Other reports indicate it could have been introduced at a similar show in Omotesando in late April.Â Panasonic’s new patent pending No-Constraints carpet available in white, brown, and a combination of white/black that looks like a skunk’s tail comes in two large snake shaped lengths (1.5 meters and 7 meters). The carpet has “built in” heating units that only warm the portion of the carpet you are touching to give it a lifelike, cuddly feeling. There intended purpose appears to be as “warmers”, something to wrap up with on the couch on a cool night or curl around your feet. Its very easy to image plush virtual pets that warm to your touch built from this fabric. It looks like they currently actually “plug into” the wall via a longer thinner hair cord (see the white tail running to top right corner of the image from the skunk colored snake). Control panels for the snakes are modeled after paw pads. Cuddled virtual pets would need to be battery or solar powered and heat takes a lot of power. They might somehow be able to reflect heat from the user to feel more lifelike? We have seen some microwaveable dolls (built with the small heating beads called thera-beads, thermi-beads,Â medi-beads, etc.) that can be heated and then held. But not seen true heated virtual pets to date that I recall. The photo comes from IN-duce on Flickr.